My mother used to say that her kids should have excellent manners since we never used them at home. If that's true then most anglers I have encountered in recent years must have excellent manners everywhere else because I fail to see them demonstrated when they are fishing. It wasn't always that way, but like many things in our modern world things aren't like they used to be. One of the truly unfortunate things I have witnessed over my many years of angling is the loss of manners among anglers. The mentality that I'm number one, and it's all about me mind-set that has engulfed much of our society has found its way into the world of outdoor sports. If you believe man evolved from apes you might find ample ammunition to support your theory when observing the behavior of some anglers or their guides. This is one of my pet peeves, and the absence of good manners in outdoor sports is simply unacceptable. We use to say that manners were merely common sense, but one thing my years of being a judge taught me was that common sense is not common. Remember this first; whether you are chasing a trout, hunting a buck, or stalking a butterfly with a camera any competition involved should be between you and the item you are pursuing and not between you and another person. There is a place for competition between individuals but it does not belong in any recreational outdoor sport. When considering angling, here are some simple rules every angler worthy of the name should observe. The wading angler has the right to wade and fish the water without interference by other anglers whether afoot or afloat. Unless it is unavoidable, a floating angler should never float so close to a wading angler to either endanger the wading angler or ruin his fishing. Under no circumstances should a floating angler cast into an area being fished by a wading angler. 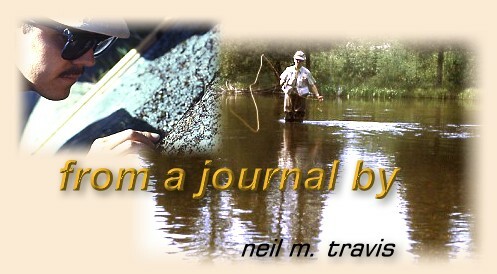 Anglers wading against the current have the right of way when encountering an angler wading with the current. Under no circumstances should an angler enter the water immediately above or below another angler, even if the other angler is merely sitting on the bank. Unless you ask, do not presume that they are done fishing or that they will not mind. Do not walk on the banks near where another angler is fishing, especially in areas where the banks are undercut or where grass or bushes hang out over the water. Trout are quite sensitive to vibrations, and any trout that is resting next to the bank will be spooked by your footsteps. Unless you know the other angler do not attempt to engage them in a conversation while they are fishing. If you feel that common courtesy requires some gesture a nod or a wave is sufficient to acknowledge their presence. I may be a bit of a curmudgeon in this area, but I believe if you are looking for conversation there are better places to find it. Sir Isaac Walton said that fishing was the contemplative man's sport, and it's difficult to be contemplative when someone is jacking their jaws while you're trying to fish. Keep your comments to yourself. I have encountered some anglers who want to express their opinions about how and where other people are fishing by shouting out insults or similar comments when they encounter other anglers who don't conform to their ideas about how the sport should be practiced. If what you see is illegal report it to the proper authorities, but if it's simply not the way you would do it, keep it to yourself. There have been instances on some streams where such confrontations have led to bloody lips and worse. If you want to engage in name calling and insults become a politician. It pays better. If the water is crowded with other anglers don't hog a prime spot so others cannot fish there. Don't plant yourself in the best spot on the water and stay there all day; and don't intentionally wade into a place where floating anglers cannot get past you. In plain English, don't be a jerk! Floating anglers should follow similar rules when encountering other floaters. If the stream is wide enough to allow you to pass stay as far away from the other boat as possible and pass as quickly as possible. Do not cast toward other boats unless the stream is wide enough for you to do so without casting into water the other angler might be fishing. There is a place for boat races but when engaged in sport fishing that is not the place. Cutting off other boats so you can fish a certain piece of water, parking your boat where others are fishing, or any similar behavior is crude, boorish, and immature. If you are launching a boat at a public launch site remember you are not the only person who has a boat to launch. Load your gear in the parking area before you back your boat down the launch ramp, and once your boat is clear of your trailer get your vehicle off the ramp so others can get their boats in the water. In a similar manner when you are taking your boat out of the water don't block the ramp while you are unloading your gear out of the boat. Get your boat on the trailer and pull it out of the way. You can unload your gear in the parking lot.